I live between two mountain ranges, but when you speak of “the mountain” around here, everyone knows you mean Mount Rainier. To say “the mountain is out” makes perfect sense to us because when it is visible it seems to be everywhere all at once. Its size and beauty can make your jaw drop. And, my friend reminded me, as we drove toward Paradise yesterday morning, the mountain also talks. Only last week, it claimed a life in circumstances where listening to the mountain might have made a difference. The mountain speaks in many voices. On an early summer day it told of sunshine, wildflowers, and too little snow for the time of year. A volunteer I met on the trail told me that there was plenty of rain this winter, but the temperatures never dropped enough to create much snow. As a result, there’s not enough snowpack on Mount Rainier or in the Cascade and Olympic ranges. I am not particularly knowledgable about climate change but it seems foolhardy to ignore the evidence of your own eyes, or to fail to listen when a mountain is trying to tell you something. This will be a hard summer for fish, bad for fire season, and too dry in the lowlands, as well. The Native American names for Rainier are Tacoma, or Tahoma, which might mean “mother of waters.” Whatever you call this mountain, she talks. She speaks in avalanches and waterfalls and great mysterious cracking sounds that echo down the slopes. She speaks in the whispering sound made by a flicker’s wings, in a marmot’s whistle, in brooks and breezes. The mountain also follows you. Well, follows me, anyhow. Driving anywhere within her ambit, I often look up to see her in an unexpected place. Of course it’s the road that shifts direction, but often the mountain itself appears to have moved from the right side of the road to the left or from slightly north or slightly south to a point straight ahead. That’s all wrong and I know it, but the illusion is a powerful one and I can’t quite believe it isn’t real. Here’s the story, as I heard it, about the young man who died on the mountain last week. He and his friends were climbing without a guide and were caught in a sudden white out. In the first instance, they did the right thing: hunkered down in a crevasse. But when they realized they had left their camp stove at another site (not far away, apparently, but far enough), the one who would lose his life set out to retrieve it. He was not roped up. If he had been, he probably would have made it, or at least made it back to where he started. This is such a heartache, but how I wish he had listened to the mountain. How I wish he and his fellows had been climbing with an experienced guide. I just can’t help saying this, as well: I grew up in the Midwest and we had some bad weather, too, even though we had no mountains. I remember hearing stories about farmers who roped up to get to their own barns in a blizzard and some who didn’t and never made it back. To their own barns. When a great mountain speaks, pay attention. 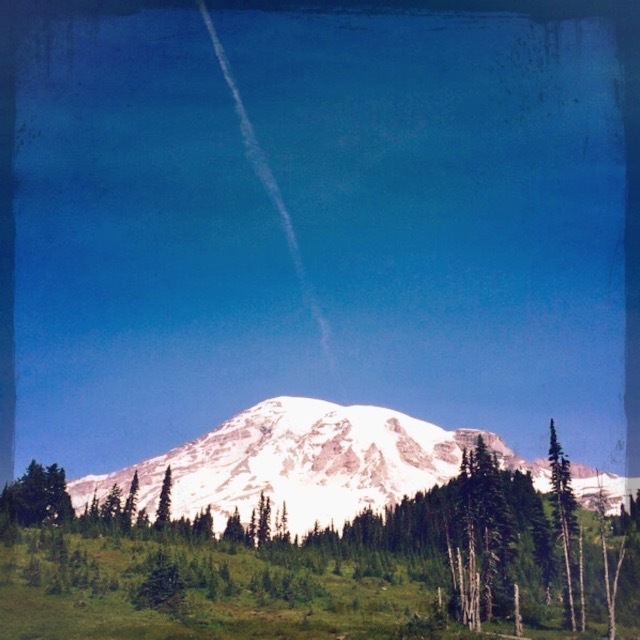 Categories: Pacific Northwest, Travels | Tags: climate change, geology, Mount Rainier, mountain climbing, Paradise, weather | Permalink.